These 2 bedroom condos are located in the Phase I Oceanfront section of this Oregon resort. These 1170 square foot units have breathtaking views as they are situated on a cliff right above the ocean. 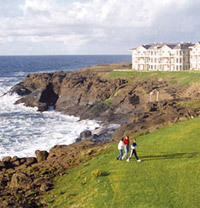 As stated, each Worldmark Resort Depoe Bay Oregon condo has two bedrooms, one with a king bed and one with 2 twin beds. The living room has a queen sleep sofa. There are 2 bathrooms, and the master bath has a jetted tub. The unit has a full kitchen, washer and dryer, patio or deck with a gas BBQ, and a gas fireplace. The three bedroom condos are about 200 square feet larger, with a third bedroom containing a queen bed. Please click here to see current availability, prices, payment options, photos and other information regarding Worldmark Depoe Bay Resort condo vacation rentals.